As the signs of spring become present just days before it officially arrives on March 20th, I can't help but be grateful for all that surrounds me. I was walking through the grocery store a couple of days ago and saw some flowers on sale. The buds were small and unopened and I could not visualize what was yet to come or how they would look when they would eventually open. I've purchased flowers before that never opened which made me sad. Potential of something that was unable to reveal itself. My mother's name is Violet, and I've always been fond of purple, so I purchased them anyways and two days later, they opened and really were amazing. The point is, I was unable to see what the flower would look like when I bought it, but I knew something amazing and beautiful would likely emerge soon, and it eventually did. That's how I have been feeling about my life lately... I'm in this situation, recovering from cancer, not knowing what lies ahead for me, but I cannot help but know in my heart that something amazing will emerge from it. I have been able to eat entirely by mouth for the past month, not having to use my abdominal PEG tube whatsoever. The best part is that I can actually keep my food down. That's amazing. I was unable to visualize the day coming that would allow me to actually eat enough food by mouth to sustain me and keep it down at the same time. Such a huge blessing that I would have taken for granted just a year ago. I have to be transparent though. Seeing that tube dangling from my belly every morning when I woke up was disheartening. I felt like a freak of nature. A broken man that would never be whole. It was like an umbilical cord that wouldn't go away. As the silicone tubing started so show it's wear and tear months after it was installed at Virginia Mason, the tube filled with debris from my stomach. It looked more disgusting as each day passed. Then I realized that I really was done with it. After meeting with one of my oncologists, he said it was time for it to come out. He would make arrangements. It was scheduled for March 4th. My daughter, Ashley, picked me up to drive me for the big procedure at St. Peter's Hospital. I really didn't know what to expect. My name was called as we sat in the waiting area and I was led back to a procedure room. 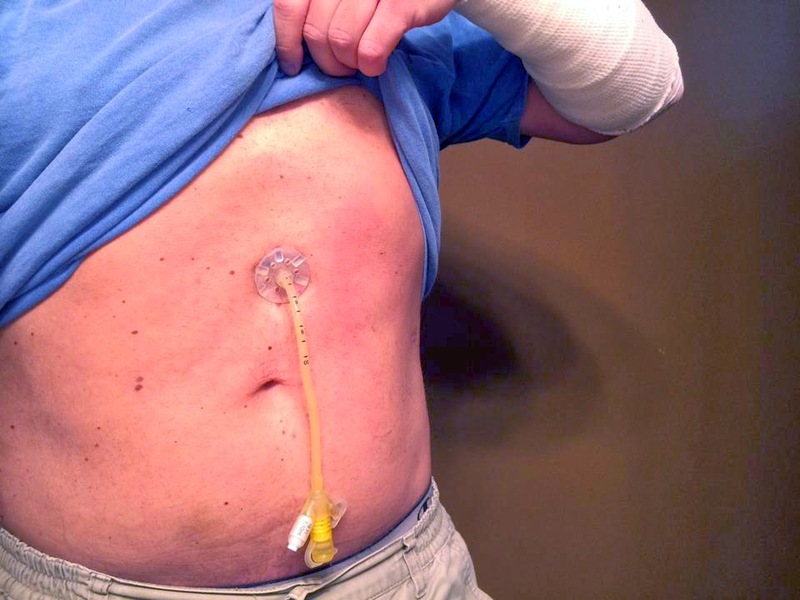 The nurse used a syringe to remotely deflate the bag that was holding my stomach lining tightly to my abdominal wall. She made small talk as she drew out some air and clear liquid and then she said, "Ready?" It was literally pulled out in a matter of 2-seconds. It just slid out. She pressed a piece of gauze over the whole and said, "This will seal itself up in 24-hours. Don't eat or drink too much." And that was it. After removing the bandages the next day, I couldn't help but grin. There it was. I had a second belly button. I now have a daily reminder that I was never a freak of nature. Rather, I was being given a reminder of a second chance, a new beginning in this life. My original belly button was a lifelong reminder of the first half of my life, when my parents brought me into this world. My new belly button is a symbol of the second half of life. Now, the question is, what do I do with that second half? In the pasts weeks I've not just been feeling better, but trying to get out of my comfort zone, doing things I've always wanted to do. Most recently I have begun painting. Except for Mrs. Ward's art class back in Junior High, I have never painted. The first thing I did was turn on my Apple TV and started watching Bob Ross' painting videos that streamed from YouTube. Remember him? Skinny white guy with the big Afro hair style who would talk in a soft voice and talk as he painted? He would usually say things like, "Let's put a little tree here. It's a happy little tree. He loves being in the sunshine, next to the gentle brook in the calming breezes coming off of the mountains we just created..." I could watch him for days. Truth is, I'm not really a guy who likes painting, or even photographing landscapes. Nevertheless, I started painting and did try a landscape. It was of a photo I took in the mountains of Sedona, Arizona. I also painted my daughter and son in law on the beach after their wedding ceremony. That said, I do like wine. Well, I used to like it until my treatment changed how my palate perceives what wine tastes like. But I love the look of wine in light whether in a glass or bottle, so I have given that a try and it has been relaxing and fun. But it still doesn't answer the question... what now? My Spokane, Washington class. 29 students who blessed me. Three weeks ago, I sent my lead assistant, Charity Lisherness, off to Chicago to meet up with another one of my assistants, Evelin Zagone. I sat at home going stir-crazy, wanting to be there. Last weekend I decided to travel with Charity to Spokane, Washington to teach my Secrets of Deep Tissue program. Going was: 1) against the advice of a few of my friends, 2) less than three months from when my chemo and radiation therapies were complete, and 3) less than two months from when I almost died from systemic sepsis and respiratory failure, but I wanted to get back to work and the idea of sitting at home didn't sit well with me. It is humbling to think that potentially millions of people across this country have been helped through the trainings that my staff and I present. Thousands of therapists and physicians have learned techniques to help get patients out of pain over the past 13-years and those thousands of therapists and physician's have each helped thousands of patients get well. It is staggering when I sit back and think about it. On Friday morning, March 7th, Charity and I packed up our materials, drove to SeaTac, and flew east of the mountains to Spokane. The seminar was not only better than I had hoped, but it blessed me in ways I never had expected. The students blessed me far more than I blessed them and it was overwhelming. I felt humbled. What was even more a blessing is when a woman named Sarah Wood came up to me at the end of the weekend and told me that God gave her a word that she was to gather a few students together, lay hands on me and pray for me. I did not hesitate. When we wrapped everything up, a half-dozen students came to the front of the room and prayed for me, blessing me and encouraged my heart. I was truly touched. We should have brought tissues. So now what? Where do I go from here? I do not have an answer to that question yet. I feel as though I am supposed to use my story and what I have shared in this blog to bless others, but how? I was talking to a friend this week about how I see me versus what others see when they see me. Everyone seems to see something different. Some see hope, courage and fortitude while others see an example of some sort. Others, however, see cancer when they look at me or when my situation comes to mind. I don't have time to focus on cancer, but they do. It scares them. I have friends pulling away because they do not want to draw close to me only to find out that the cancer returned later, tearing their hearts apart. I don't have time for that. I have the remainder of this life to live and a fixed number of days to live that life. The message of my life is not that I have fought cancer valiantly or that I am winning or won a battle. That is not my story at all. We all have battles. The message, what I want to share with others, is the answer to this question: "What Will YOU Do With The Gift of Life That You Have Yet to Live?" Are you looking through a telescope so that you can view what you yearn for only to realize you are surrounded by an amazing destiny that lays right in front of you? Will you allow the broken dreams of your past and the scars on your heart to be anchors that stifle your future? Does the the lack that you perceive in your life define you? What if I told you that you have everything that you need at this very moment to take the first step to a new future? You don't need a new "belly button" to realize that something amazing can begin within you. Are you keeping your eyes open? More importantly, are you ready for what lies ahead?